We accept VISA, MasterCard, and Discover directly for phone, email orders and in store purchases. Secure online payments can also be made through our website and PayPal account. Exclusions: Certain products are excluded from our free shipping offer due to manufacturer restrictions. Also, over sized items or Items weighing more than 75 lbs may incur extra shipping charges. Approval Period, Taxes, Duties: Most instruments ship with a 48-hour approval** period during which time you can comfortably evaluate your purchase and determine if it’s right for you. The prices listed on our website do not include shipping charges or any applicable taxes, duties, or custom fees. Instruments shipped within Oklahoma are subject to a 8.375% sales tax. All out-of-state shipments are tax-free though we do recommend you look into your individual state’s tax codes to determine any tax liabilities. At OKC Music we’ve been shipping instruments since we opened in 2008. We usually use Fedex Ground Shipping due to excellent service and freedom from damage. Shipments are always insured for the full purchase price. **There are instances where the approval period does not apply. If you’ve played the instrument in our store and we then ship it to you, there is no approval period. If the item is a Sale Item (special there is no approval period. There are no returns accepted on electronics (amps, pickups, pedals, etc) unless the product is received in damaged or defective condition. In Store Returns: For in store Sales we offer a 14 day exchange return policy. We are happy to offer full store credit if item returned in same condition as it was bought, unfortunately we cannot offer cash refunds for in store purchases. Layaways: All layaway sales are final. 25% of total down. Balance due minimum 1/3rd 30-60-90 days from layaway date. 25% original purchase price restocking fee if default on terms. Need more information? Give us a call today! 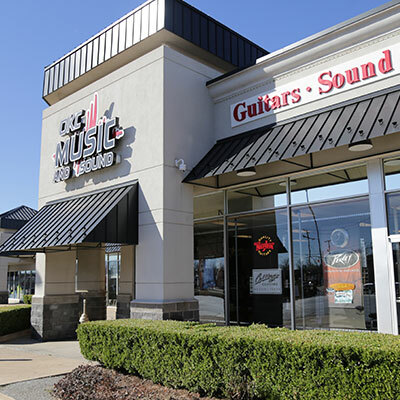 OKC Music and Sound’s management and staff have decades of experience in music and music retail. Above all else these many years have taught us what works, and what doesn’t for end users in guitars, amps, sound gear, and drums and percussion. Now we all know that this is a new day with national chain retailers bringing awesome selection, good pricing, and good looking merchandising to the table, not to mention the Internet.